Specialist Nadine Garcia ’19 is a full-time student studying international business with an emphasis in global trade and linguistics at Mihaylo College. She was still a senior in high school and just 17 years old when she officially signed on to join the United States Army Reserve, and she currently holds the rank of specialist. I spoke with Spc. 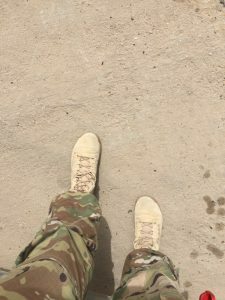 Garcia on the exact date of her fourth military anniversary to learn more about what it’s like being a full-time student while also serving in the military. Specialist Nadine Garcia was born and raised in Montebello, California, and moved to Fullerton to be closer to campus. At first glance, she may seem to have the “typical” student life as a college junior. She attends class in Mihaylo Hall most mornings and works a part-time job at Huntington Beach Harley-Davidson. If she has any time left over, she spends it with her friends and family or plays with her dog, Harley. What most people don’t know about Spc. 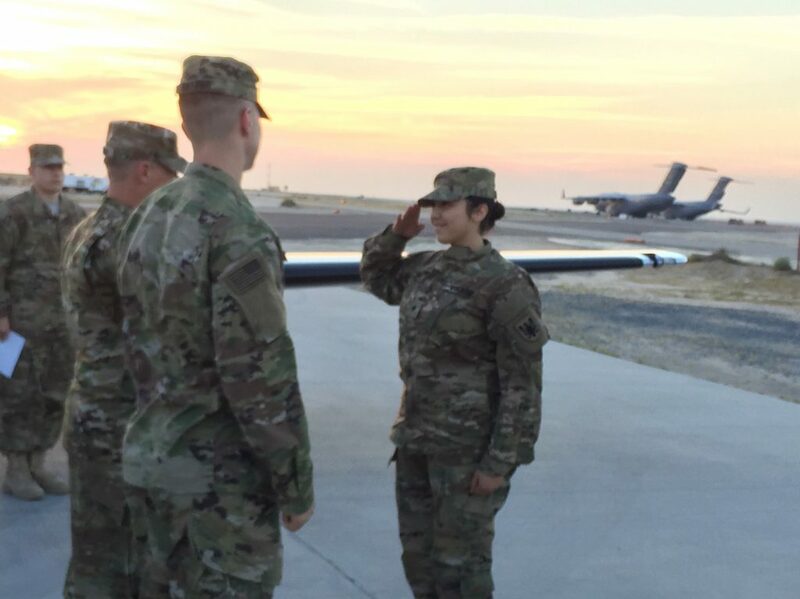 Garcia is that in 2016, she served her first deployment in the Middle East. And one weekend out of every month, she attends Army Drill Assembly, preparing for future deployments. Kuwait is a Middle Eastern country nestled between Iraq and Saudi Arabia. Spc. Garcia was stationed at Ali Al Salem, one of 10 U.S. military bases in Kuwait. Specialist Garcia with Major Jesus Cruz, the Battalion Commander of the Cal State Fullerton ROTC program. Through these campus organizations, Spc. Garcia became part of a close-knit community of people with similar experiences. The VRC and SVA are a diverse group of individuals who range from 18 to 60 years of age and have differing levels of involvement with the military. Along with the rest of Cal State Fullerton’s military population, Spc. Garcia also has the Veteran’s Resources Center to lean on for help and academic support. Spc. Garcia credits these two groups with helping her more easily adjust back to civilian life and providing her a social outlet. 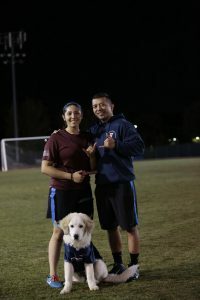 She participated in the annual Vets Versus Cadets flag football game in November, a tradition that started four years ago. “We won this year. For the first time, the vets beat the cadets,” says Spc. Garcia, who was recognized as this year’s most valuable player (MVP) on the vets’ team. The Cal State Fullerton student body proudly hosts a large community of military members. This community includes students who are a part of the military as veterans, active duty, reserve service, retired military or dependents. For more information on resources that are available to students involved in the military, please visit the Veterans Resource Center and check out the Student Veterans Association at Cal State Fullerton.